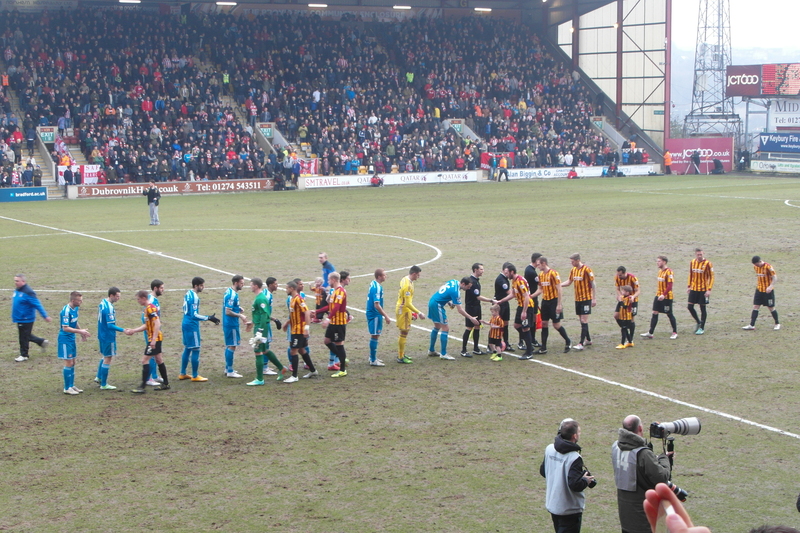 The diamond system was one of the most controversial features of the early season at Bradford City. Seemingly designed to bring the best out of Aaron Mclean, it was too easy to shut down going forwards and had some obvious weaknesses defensively. It also completely failed to bring the best out of the underperforming Mclean, although I’m not sure any system could’ve managed that. The good run from November onwards was triggered by a switch to a 4-4-1-1 with Billy Clarke playing behind Jon Stead – and the diamond was seemingly consigned to the dustbin, only to be brought back when Clarke was injured and James Hanson returned in late December. Since then, the diamond has been far more successful, and a big part of the recent cup success. So why has this system suddenly started working again? The diamond formation at the start of the season was very narrow, with central midfielders in the wide positions. This meant it was quite easy to shut down, as all of the creativity came through the point of the diamond; and while it could dominate the middle of the park, there was very little protection for the full backs in wide areas. 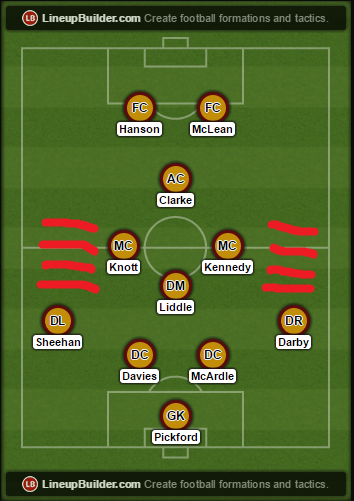 This particularly hurt the performances of Stephen Darby, who was being expected to contribute much more going forward than he was used to; and as a result was getting caught upfield and doubled up on. The key change here has been the introduction of Filipe Morais for Jason Kennedy. Morais naturally plays wider, which gives the side another creative dimension and ensures that Darby has the full back-winger partnership that he thrives on. 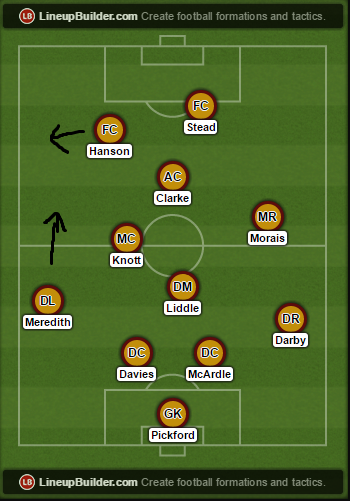 The left-sided City player still tucks in to ensure that Liddle isn’t completely overrun, but this hurts the team less because both left backs in the squad (especially in the case of James Meredith) are much more comfortable going forward, and Hanson is able to help as well by shifting further to the left. This means that the formation becomes lop-sided, but harder for an opposition to shut down. The other key change in midfield has been the end of the experiment of deploying Billy Knott as a holding midfielder. He was excellent in the role against Leeds, when they were down to 10 men and not closing him down, allowing him to run the game, but he was often overrun in league games and also wasn’t able to create around the box. This also necessitated moving Liddle to the left, which only exacerbated the narrowness of the system. Knott has benefitted from being deployed further forward, where his ability to create chances is greater and his tendency to occasionally give the ball away has less of an impact. He’s fitted into the system well, both on the left of the diamond and in the hole behind the front two, where he provides more of a goal threat. Up front, there have also been some important changes. The season started with James Hanson alongside Billy Clarke, although that quickly shifted to pairing Hanson with either Mason Bennett or Aaron Mclean, and switched again to a Clarke/Mclean pairing when Hanson was injured in September. There were several issues with this set-up. 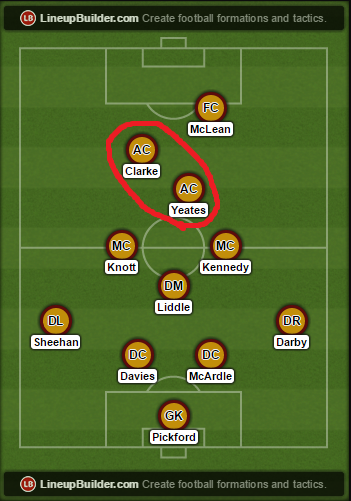 Firstly, when Clarke was played up front, he naturally dropped deeper and ended up in the same space as Mark Yeates at the tip of the diamond, crowding an already crowded middle. When Hanson was absent through injury, there was no physical presence up front who could hold the ball up, and therefore the defence had no out ball when under pressure. The final issue was that Hanson never clicked with either Bennett or Mclean. Mclean in particular failed to read Hanson’s flicks or make the important runs that a target man needs. The arrival of Jon Stead has solved these problems. Firstly, he’s capable of winning the ball in the air and holding it up, meaning that he can link better with the midfield. Secondly, the fact that he can do this allows Hanson to play the wider role and helps solve the lack of width on the left caused by Knott or Halliday tucking in to help Liddle. This wasn’t possible with Mclean, Clarke or Bennett as Hanson’s partner, as they simply lacked the physical strength (in the case of Clarke and Bennett) or technical skills (Mclean) to ensure that the ball stuck up front. The new midfield system is aided by Hanson playing wider on the left. Previous space on the flanks has been filled without giving up too much in the middle of the park. The final change from the start of the season has been at left back, with Meredith replacing Alan Sheehan. Meredith provides more of an attacking presence and gets up and down the left hand side better, which is key as this system still leaves a bit of a gap on the left with Knott or Halliday tucking in. This is a much more minor change, but has still been a factor in the recent success – just look at the second goal against Sunderland, where Meredith was furthest forward and pressuring Johnson into a mistake, knowing that he was quick enough to get back if it all went wrong. Phil Parkinson deserves huge credit for these tactical changes. He saw a system that initially worked, but had easily exploitable weaknesses, and has tweaked it so that it maintains the main strengths of the diamond – dominance in midfield and a creator behind the front two – whilst limited the narrowness of the system, which was its main weakness. As well as this, he has brought in personnel more suited to playing the roles that he wants, which has led to the team flourishing. Long may it continue! Tim Penfold is the Bradford City Assistant Researcher for the hugely popular computer game series Football Manager. His role includes deciding all of the Bradford City player ratings and other data related to the club (finances, stadium, training facilities) which goes into the game. Amazing! 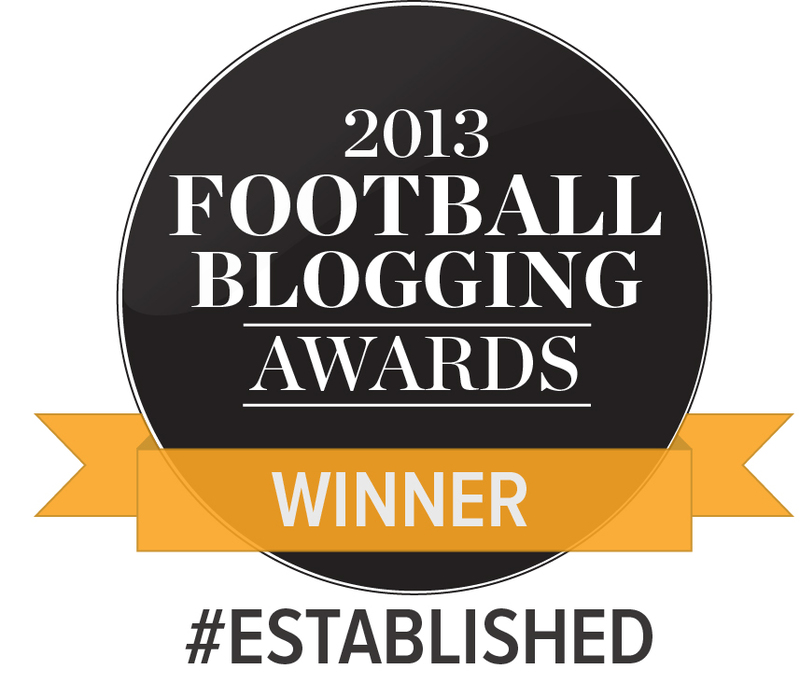 According to fans of most other L1 clubs we just hoof it! Excellent analysis. It will be interesting to see what happens at the weekend if we are without Morais, Hanson & Stead. It is also the reason we do so well away from home because the emphasis is for the home team to attack, it leaves far more space for the quality players to utilise. This is why we struggle occasionally at home, as two banks of four make it difficult to break down, which may be why teams see us being more direct at home. There you go it’s that simple . Although a whole new formula dictated the victory at Orient. Excellent piece of writing. And thank you for explaining the Diamond, and why it appears to be working now when earlier in the season it wasn’t.